Aaron, for his part, had been excited for Astro Camp. It is a rite of passage, filled with mystery, and a very big deal. In the days leading up to it, it was he who suggested it was time to pack, he who picked out his clothes, he who stuffed them in a duffel bag. On the morning of Astro Camp, there was no expression of reluctance, no worrying, no timidity. We left the house early; he was eager to be on time for the bus. This was the boy who, at four years old, would not let me leave him at pre-school, who begged through anxious tears to come home with me, who would only play at another child’s house if I stayed, even when all the other four-year-olds were separating without a wrinkle. I had tried to comfort myself then, that one day that would change. One day we would have a painless separation. One day he would be confident to leave me. One day. 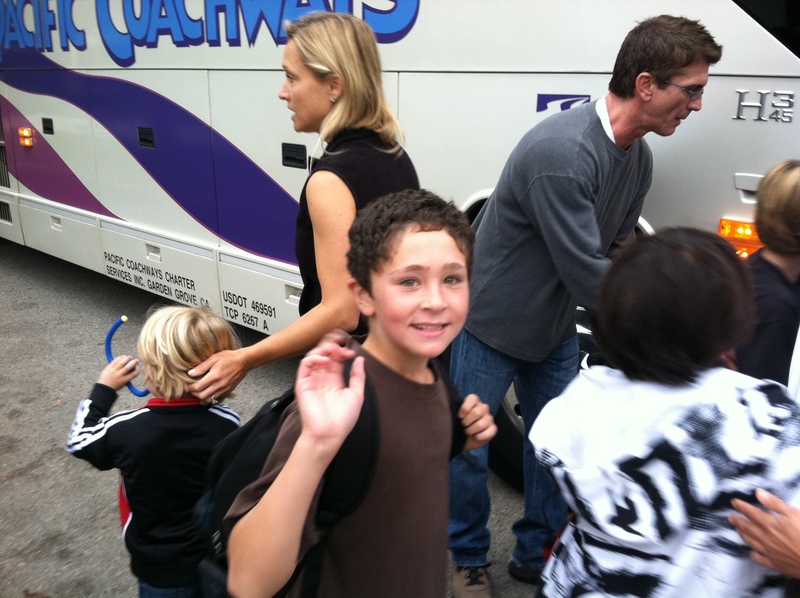 When we got to school, we threw his gear onto the bus, and he went inside to meet his classmates. I waited outside with a smattering of other parents, lingering until the buses were loaded and gone. As the fifth graders emerged from the schoolhouse marching toward the bus that would carry them over the hurdle of Astro Camp into the home stretch of elementary school, we each looked for our triumphant hero. I saw mine, and my heart beat faster. I grabbed a photo with my phone as he approached the bus, then he did something unexpected. He paused in front of me. Only when I heard a mom beside me say, “Aw, you still get a hug?” did I realize what was happening. He was initiating a last embrace. I quickly hugged him, kissed him, dropping my phone in the befuddled process, then stepped back as he disappeared into the dark-windowed bus. I waited until the bus pulled away, not knowing if he was looking for me, but waving just in case. 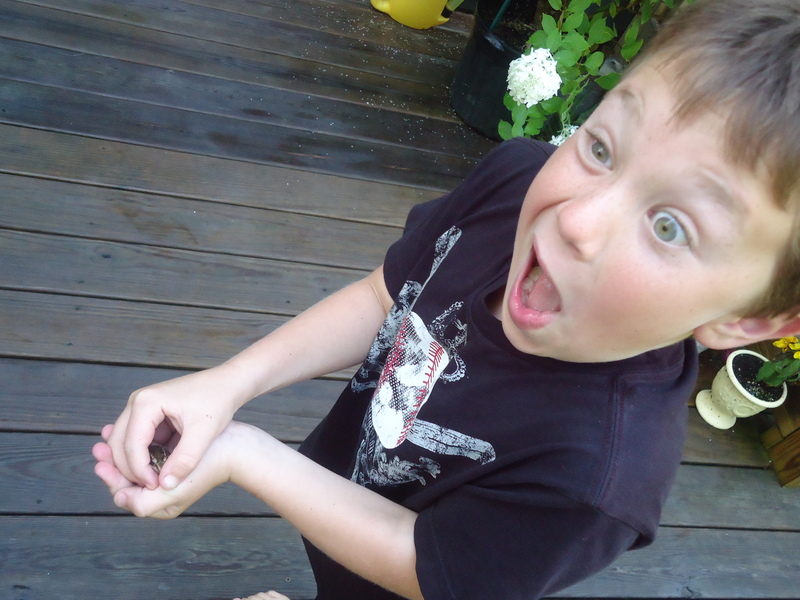 Friday afternoon brought much joy all around: a weekend reprieve from school’s structure for Emmett, and Aaron’s return. I hugged Aaron too hard and too long. “Too much love, Mom,” he counseled me. I let go reluctantly, and grasped my hands together behind my back. He casually wore his new Astro Camp sweatshirt and regaled us with stories of bravery — climbing high towers and ziplining and traversing pitch dark mazes with the help of friends. Emmett listened intently to what the future held in store for him, if he could only survive four more years of the classroom. I think of all the things that will happen in those years that will lead my boys deeper into the maze of maturity, sometimes groping through the dark, building their bravery with the help of friends. I feel with bittersweet pride my primacy receding. I watch and wait on the side, hoping for that small grace of a kiss, before they roll away. Sometimes I think the reason I switched Jessica to a new school so abruptly is so that I wouldn’t have to suffer through the Astro Camp week away.